The search of a drinkable $6 Pinot noir continues. This was discounted at Fred’s from $8.49 to $5.99, and I like its fancy twirly cap since, as I have mentioned in the past, my good wine key is missing. Color: Darkish red. Nothing too noteworthy. Nose: lots of sandalwood and vanilla, so I’m figuring they oaked this with chips? Some green pepper – weird – but also some pretty cherry scents. Vanilla and cherry are nice together, and I’m down with spicy wood smells. So far I’m cautiously optimistic. Palate: cranberry and sour cherry, very mild tannins – but enough to give it a bit of structure – and a slight lingering touch of spice. One might go so far as to say “sprightly.” Really a pretty long finish of tart cherry, considering. Nothing requiring deep thought, but entirely quaffable. 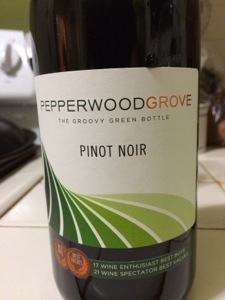 If you can find Pepperwood Pinot Noir for 6 bucks, it’s worth buying one, maybe two bottles for easy & inoffensive drinking. Woot.